When the post lands through our doors or on our desks we’re already thinking about what is inside. But what use is a mailing if you don’t get your mail past first post? Using bespoke and printed envelopes you can start to deliver your message FIRST and before the envelope has even been opened. 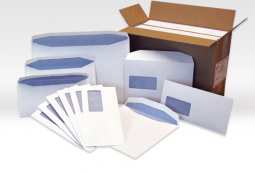 Heritage Envelopes can produce a wide range of bespoke envelopes, personalised to suit your mailing requirements. Call us with your query on 01254 278200, or alternatively complete the contact form and we will be in touch shortly.